[dropcap]T[/dropcap]here’s a lot to be said about Antonio Valencia’s blockbusting opening strike against Everton last weekend; the sweetness of the hit, the sheer ferocity of the shot, and the pleasing sound of the ball thumping the back of the net. Perhaps the most noteworthy observation was the understated way the Ecuadorian celebrated his goal. He simply jogged back and crossed his chest before acknowledging an onrushing Phil Jones. Captain quiet. When José Mourinho waltzed into Old Trafford eyes were quickly cast at the playing squad. Who would be retained; who would be shipped out? There were a few names that immediately stood out as destined for the chop, but after the Community Shield and first couple of Premier League fixtures a number of these unlikely lads have stepped up to prove their worth to the Portuguese manager. Some could become components in a potentially successful season. To much surprise Antonio Valencia signed a new, three-year, contract with Manchester United this week. Once bearer of the famed number seven shirt, Valencia’s star has fallen as much in reputation as output in recent years. The appointment of high-flying Louis Van Gaal is seen a sign of United returning to its attacking history, but retaining the Ecuadorian winger has taken much wind out of the United faithful’s sails. 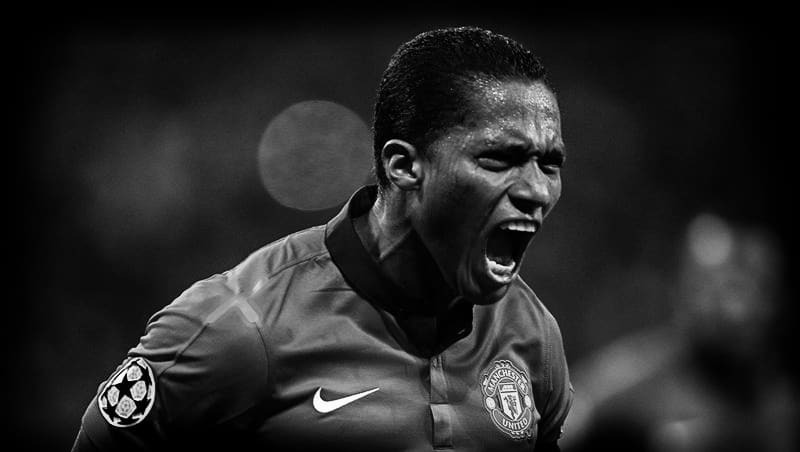 Valencia’s form is such that many fans feel that the Ecuadorian is entirely undeserving of a new contract. There had been reports of Liverpool’s interest – and so poor has the player’s form been that very few United fans would object to a move – even to a major rival. Perhaps the most rational explanation is that United’s management has sought to preserve Valencia’s value in the market. Contrary to many reports, the new United manager is not wedded to a 4-3-3 formation. In fact Van Gaal has often deployed a 4-2-3-1, while the Netherlands national team under his management is playing a 5-3-2 at the World Cup in Brazil – a point we’ll return to later. Either way, a backup winger is required with United’s cupboard especially bare in wide areas. The suspicion, however, is that Valencia provide will cover Rafael da Silva at full-back instead, with the Reds lacking cover for the Brazilian, and Valencia having been deployed in that role already. Phil Jones and Chris Smalling will be required in more central areas, after all. Valencia is now primarily known for his defensive dependability than his attacking numbers; the new Ji-Sung Park, if you will. The Korean was, with some irony, a protégé of another Dutch coach in Guus Hiddink. Yet, the data shows that the 28-year-old Valencia is rather different from other defensive wingers. The blocks that Valencia made last season suggest that he dropped deeper than Chelsea’s Willian, for example, while the Ecuadorian was far more studious in tackling than United’s Ashley Young or Danny Welbeck. The Ecuador captain has exhibited statistics more typical of an attacking full-back, although notice how many of Valencia’s defensive actions were interceptions last season. Valencia made less defensive actions than Rafael – a factor of Valencia’s higher position the pitch relative to the Brazilian – and he clears the ball less often than the full-back. This observation is obvious, although the number of chances created by Rafael and Valencia is also interesting. The images below – Rafael left, Valencia right – show that the Ecuadorian winger created chances in much deeper areas than Rafael. This suggests that despite Valencia’s more forward deployment, it was Rafael who attacked the byline. That is, Valencia was stationary and functional, Rafael more dynamic. To pin down Valencia’s default position we must establish that the proportion of interceptions in each player’s defensive actions represents the player’s positioning. 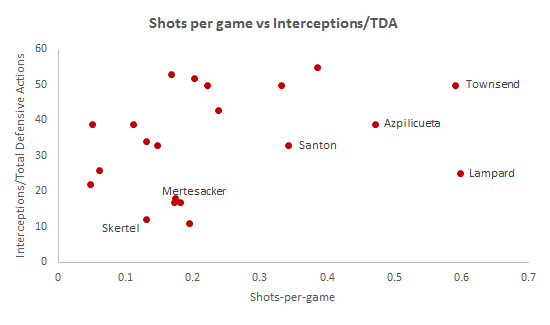 To do this we look at a randomly chosen defender and midfielder from each of the Premier League’s top 10 clubs, and then compare the number of interceptions to the number of shots per game. Each figure has been adjusted by the club’s point tally, ensuring that the experiment is unaffected by team quality. The idea is that more advanced players will make more attempts at goal than deeper players. 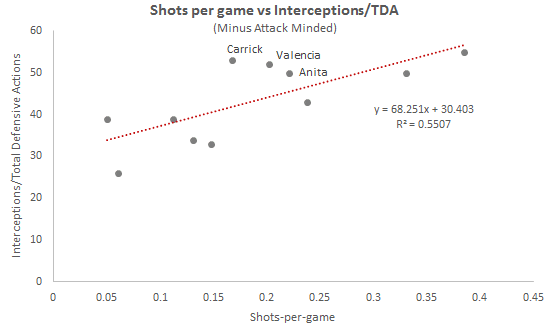 If there is correlation then we can deduce where on the pitch, and with what role, Valencia was deployed last season. Data towards the right of the chart, below, represents among others, Frank Lampard, who aggressively ventures forward, and some central defenders. They are outliers for our purpose and we remove them and see if there is any underlying trend. There is a distinguishable relationship between shots-per-game and number of interceptions. In this Valencia’s positioning is shown to be very close to that of Michael Carrick and Newcastle’s Vurnon Anita – both defensive midfielders. In other words, Valencia played in line with Carrick. Valencia played as wing-back rather than a true winger. Very few top clubs play five across the back. Juventus, however, plays such system with Kwadwo Asamoah as left wing back. The similarities between the Ghanaian and Valencia are remarkable. Valencia left, Asamoah right in the images below. The data is illuminating. In essence David Moyes played a back five last season, which helps explain the excruciating rigidity of United’s approach – and Rafael’s exile from the first team. This also sheds light on Valencia’s new contract – van Gaal could very well continue with the 5-3-2 system deployed at the World Cup. After all, United’s ace in Robin van Persie appears to be very happy with the approach. 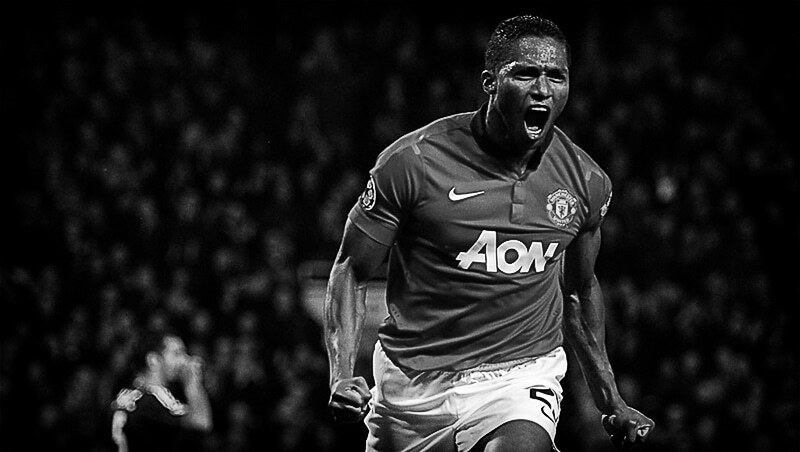 There is so little to dislike about Antonio Valencia. Off the pitch there are few late nights, no entourage of note, and no hint of the now wildly popular biennial tantrum during contract negotiations. The Ecuadorian is a family man, settled in Manchester and enjoying life in England. In training he is dedicated and professional; the “quiet, shy boy,” Sir Alex Ferguson so admired. On it a player who remains a sound professional, earning the reputation as a player who rarely lets his team-mates down. Yet, the three-year extension to Valencia’s contract announced this week is a curious reward for a player who has endured two traumatic seasons in a row. The player will handsomely profit despite so rarely excelling that his value to the team has dramatically waned – a strange statement from a club that has so loudly proclaimed its aspiration to return to domestic and continental glory. Indeed, supporters may view United’s move as one so lacking in ambition that there is a genuine fear the club’s summer strategy will once again realise far less than the sum of Ed Woodward’s vacuous spin. The negativity surrounding Valencia hasn’t always been so. The winger enjoyed a fine début season at Old Trafford – probably his best in red – when the Ecuadorian’s pace, strength and drive earned sound reviews in Cristiano Ronaldo’s wake. Valencia could never be adequate compensation for Ronaldo’s departure, of course, but it was a positive squad addition nonetheless. Moreover, Valencia’s relationship with Wayne Rooney contributed much to the latter’s 34-goal season in 2009/10. The winger suffered a broken leg against Rangers in the Champions League late in 2010, necessitating more than six months out of the game. Yet, the Nueva Loja-born midfielder enjoyed a fine end to the 2011/12 campaign as United built an eight point Premier League lead. From the depths of a hospital bed, Valencia once again became a central part of Ferguson’s team. The Ecuadorian held less blame than others as the Scot’s side blew the points to hand Manchester City the title, although Valencia was dropped as the Reds capitulated at Eastlands in late April 2011. Those glory days, such as they were, constitute a time now long forgotten. Strange, perhaps, that United should be so effusive in announcing an extension that will keep Valencia at Old Trafford until 2017. The Ecuadorian holds a one-way option to extend the deal a further year, by which time he will be 32 and more than £20 million to the good. Two years of poor form belie Giggs’ comments as little more than puff, coming after another season of chronically mediocre performances from a player demonstrating little sign of reaching previous heights. Valencia’s terrace nickname – “Turn Back Tony” – says much about a man now utterly bereft of confidence. Not only does the 28-year-old remain one-dimensional, but fans are no longer witness to the player’s willingness to take on his opponent. And on the rare occasion Valencia creates space his final ball is routinely misguided. The player’s degradation is born out in the statistics too, with Valencia scoring just four and assisting a further five goals across 39 Premier and Champions League games last season. There were just 43 successful dribbles, 24 shots and just 28 successful crosses from 147 delivered over the campaign. He produced five goals and 14 assists in 2011/12, with just one and six a year later. What the new deal says about United’s propensity to invest in wide areas this summer will also concern supporters. After all, United’s lack of quality on the wings has become an aphorism for those frustrated with the club’s transfer strategy. After all, brilliant though Louis van Gaal may be, Nani is unlikely to become more consistent, nor Ashley Young develop talent beyond his limited purview. In Adnan Januzaj there remains hope in youth, but the 19-year-old’s considerable talent cannot save United alone. And there is no little irony in the comparison with Nani. The Portuguese winger signed a five-year deal last summer only to start just nine games in all competitions last season. It was, in effect, £5 million in wages wasted on a player likely to move on this summer. Valencia needs to be a regularly starter simply to justify the new deal; a pedestal on which he has done little to rest. United may well spend this summer, but with Rio Ferdinand and Nemnanja Vidić having slipped the nest – and central midfield suffering from years of chronic under-investment – there is no guarantee that it will be on width. Valencia’s new deal suggests anything but – the club’s hierarchy enacting a considerable gamble for a manager habitually wedded to attacking players of higher quality. Yet, van Gaal has once again demonstrated his uncanny ability to establish both tactical superiority against almost any opposition and build a winning strategy this summer. Netherlands remains outsiders to win the World Cup in Brazil, but the veteran coach has unveiled a team greater than the sum of its parts. In it van Gaal has done so amid a late tactical switch to a 3-5-2 that maximises Dutch strengths and negates obvious weaknesses. Few will be surprised if United’s new coach makes similarly bold choices at club level next season – and with it Valencia may find himself in unfamilar territory. The player, meanwhile, protects a financial future that had begun to look less than sure under a contract that previously ran to 2015. Such has been the Ecuadorian’s long-running poor form that there would have been few top-line suitors had United chosen to sell this summer. Little wonder the winger is delighted to sign and the platitudes are flowing fast. That will not come until van Gaal’s side is dispatched from the World Cup. After victory over Chile on Monday that is likely to be at least a week later than Valencia’s return. Ecuador probably need to beat France this week to stay in the competition – one in which Valencia has rarely excelled. Plus ça change, fans of a more cynical bent might add. Sir Alex Ferguson delivered mixed news on the injury front today, with Antonio Valencia now training with the reserves ahead of a potential first team return in March but Park Ji-Sung now ruled out for a month with a hamstring injury. Bittersweet news of course, although the sum total could still mean his Manchester United team is better equipped for the Premier League and European run-in. “We got a blow on Saturday morning with the news that Ji-sung Park did his hamstring on Friday afternoon in training,” confirmed the 69-year-old United manager. “It was very unfortunate because it was his last kick of the ball in training as well. We were really looking forward to having him back after being away for a month at the Asian Cup. He’ll be out for up to a month, which is a blow to us. Valencia’s return on schedule after the agonising leg break and ankle dislocation suffered against Rangers in September adds not only to Ferguson’s attacking options but the flexibility of United’s squad. The Ecuadorian’s pace, eye for goal and – perhaps crucially – potential to ignite Wayne Rooney into a goalscoring run could prove the difference come May. After all, Valencia’s sound delivery from the right-wing in no small part contributed to Rooney’s 34-goal haul last season, with the former Evertonian scoring an uncanny number of headed goals. That said, United’s ability to cope with Valencia’s absence this season is not in doubt; a permanent switch to the right has brought greater consistency to Nani’s game and Ryan Giggs’ evergreen presence has provided some stability on the left, even if Ferguson’s options are limited. Meanwhile, Park’s injury reduces – at a minimum – Ferguson’s alternatives in midfield, especially in European away matches where the South Korean has tended to play in a ‘defensive attacking’ role. Park is no doubt a negative choice on United’s win, offering much less in attacking creative output that some of Ferguson’s alternatives. Yet, the 29-year-old remains a key defensive tool in Ferguson’s tactical planning. Even with Valencia at his disposal Ferguson faces something of a tactical dilemma in the coming weeks, presuming the players returns to last season’s level of consistency. After all, Nani is thriving on the right-side of United’s midfield, not only scoring but creating too. Indeed, the Portuguese has hit the net 11 times this season, contributed 13 direct assists and been involved in the build up in 31 of United’s 32 Premier League goals when the 25-year-old has started. These are impressive statistics on any level. Switching Nani to the left not only risks upsetting the player’s form but potentially unbalancing United’s attack in crucial matches away from home. Ferguson’s desire for United to never be outnumbered in midfield is paramount and in that context, it’ll be a brave move by the Scot to deploy both Nani and Valencia in key away fixtures against Marseille, Chelsea, Arsenal and Liverpool, presuming fitness on both players’ part. Indeed, recent history says that the Scot will adopt a wholly negative approach in those games, seeking first and foremost to protect United’s four-point Premier League lead and even up the tactical battle against teams that will each deploy three men in central midfield. Moreover, Park has played a crucial role in some of United’s biggest fixtures in recent seasons, such as the Reds’ two-legged victory over AC Milan this time last season. Whatever the tactical choices, Valencia’s return is a personal triumph for the player, who has become both with United’s fans and in the dressing room. The former Wigan Athletic winger’s unassuming nature, initially seen as potentially inhibiting on the pitch, is heartily welcomed by supporters keen to see performances not ‘brand development’. The players return comes with a word of warning though. Positive as the news surely is, it may still prove a long road. After all, neither Dion Dublin nor Alan Smith made it at Old Trafford following similar injuries. Neither had Valencia’s talent of course but in elite sport inherent talent is only one part of the picture. Antonio Valencia is set to miss the entire season after suffering an agonising leg break and ankle dislocation last night. The injury, which was almost as horrific as Manchester United’s unimaginative display against Rangers, required an operation this morning as the Ecuadorian winger begins the long and painful road to recovery. But what should Sir Alex Ferguson do to replace Valencia in the team? Ferguson’s likely options include shifting Nani to the right-wing and playing Ryan Giggs and Park Ji-Sung more often than previously thought likely. With Dimitar Berbatov in great form, Ferguson could also choose to shift Wayne Rooney to the left-wing in a 4-3-3 formation. However, left-field choices could be to bring French winger Gabriel Obertan into the side, promote new signing Bebé or look to an academy side packed with talented, if untested, youngsters. Finally Ferguson could dip into the transfer market this January, after all the manager still claims to have money available. Antonio Valencia is enjoying his time at Manchester United after stepping out of Cristiano Ronaldo’s shadow, says the £15 million summer purchase from Wigan Athletic. The Ecuadorian, who is United’s third top scorer with seven goals, has featured in 32 games this season in a highly promising first campaign at the club. The unassuming 24-year-old could be forgiven for freezing in the wake of the Portuguese winger’s £80 million transfer to Real Madrid. After all, Ronaldo’s 91 goals in the past three years have contributed heavily to the club’s triumvirate of Premier League titles and two successive Champions League finals. But the Lago Agrio-born winger has proven an astute buy on the right hand side of United’s midfield, slotting neatly into the side from the off. “I thought I would be used sparingly at first and then more as I settled in at the club, but as a footballer you train hard so that you’re always prepared to play,” said Valencia, who missed out to the resurgent Nani for a place in United’s starting formation against Arsenal last weekend. Many – including Rant – suspected that United would fall short of goals this season, with Valencia’s record of just seven strikes in two seasons with Wigan unpromising. But encouraged to get into more scoring positions, the wide man’s pace and shooting ability has proven invaluable to Ferguson’s men. “I’m getting into the box more than ever before in my career,” said the Ecuadorian international, who has more than 40 caps for his homeland. Should Valencia make double figures this season it will represent a productive return-on-investment for a player who cost less than a fifth of Ronaldo’s huge transfer fee. Not bad for a player who boldly turned down a move the Spanish capital a year ago. “Cristiano was an unbelievable player. It was inevitable at some point he was going to leave. We have adjusted to it. Antonio has done well and his development has been good,” said Ferguson earlier this season. “The good thing about him is that he is as tough as boots and has great stamina and speed. He’s a quiet and shy boy and I don’t think with his personality he would be interested in trying to outmatch Cristiano. He has been unaffected by the position he is playing in. The player’s speed and direct running has impressed both fans and manager this season, although he has found himself on the bench in recent matches. Indeed, Valencia’s greatest challenge now is not the shadow of Cristiano but competition from Nani, whose mesmerising form on the right-wing against both Manchester City and Arsenal in the past week has taken the fans by surprise. With Nani creating two goals for the club on Sunday, Valencia may need to warm the bench for a while longer. Yet, there will be no tantrums from the hard-working former Villarreal player. Summer recruit Antonio Valencia is improving fast, says Manchester United manager Sir Alex Ferguson. The former Wigan Athletic right-winger, recruited for more than £16 million, has now scored six times in an increasingly prosperous season. It is already the Ecuadorian’s highest scoring campaign in European football. “Antonio is improving, there is no question about that,” said Ferguson of the winger who has appeared 19 times this season. “He was only a quiet lad when he came but he is more expansive now and he is expressing himself on the pitch very well. Valencia scored United’s third goal in the club’s victory over Wolverhampton Wanderers at Old Trafford Wednesday night, in addition to strikes against CSKA Moscow, West Ham United and Bolton Wanderers. The unassuming 24-year-old, handed the unenviable task of replacing Cristiano Ronaldo at United, is winning over both fans and manager with increasingly influential performances for the club. When Antonio Valencia stepped on the Old Trafford pitch for the first time since his £16 million move across Lancashire from Wigan Athletic the spotlight shone firmly on the Ecuadorian. Not without good reason, as Cristiano Ronaldo’s heir-apparent, the mild-mannered 23-year-old held the weight of expectations on his shoulders. The hopes and fears of United supporters, 13 games into Valencia’s Old Trafford career, now closer to being realised. Valencia’s match-winning performance in Manchester United’s 1-0 victory in Moscow Wednesday night marked another progressive step in the Lago Agrio-born winger’s career. Hugging the touchline, with the confidence to pose a constant threat, the wide man scored for the second time in as many games for Sir Alex Ferguson’s side. Valencia’s display against Moscow was a strong follow-up to a positive run-out for United in the Premier League Saturday last. Valencia’s old-fashioned display, scoring United’s second – ultimately winning – goal against Bolton Wanderers at Old Trafford, may have been a turning point in the former Villarreal player’s career in Manchester. But it was an uncertain start for the former Wigan player, with Valencia starting as many games on the bench as he did in the team during United’s first 10 games this season. Indeed, the Ecuadorian’s performance against Arsenal so lacked in conviction that Ferguson hauled the winger off and supporters were right to hold doubts about Valencia’s ability compensate adequately for the loss of Ronaldo. Indifferent performances at the start of an Old Trafford career are hardly a problem unique to Valencia. The question for many players is whether they are able to overcome the increased weight of expectation that comes with playing for the world’s best-supported club. Stage-fright says Nemanja Vidic, a man whom endured an equally shaky start to his United career after an £7.8 million move from CSKA Moscow in January 2007. “At the beginning of the season, Antonio had some difficulties because he was bought to replace Cristiano Ronaldo,” said Vidic. Valencia’s record at Wigan and on the international stage – he has 40 caps for his native Ecuador – suggests a man big on talent but little in end-product in front of goal. The winger scored just seven in 89 appearances for Wigan and only a marginally more impressive return for the national team. But if lack of goals is a concern then perhaps supporters are concentrating on the wrong aspects of Valencia’s game, says club captain Gary Neville. Where Ronaldo came to dominate both United’s goalscoring and tactical deployment, Valencia offers an altogether different proposition. A throwback to a day when wingers, were wingers, Neville argues. “Antonio Valencia caused them [Moscow] problems after the break. He is strong and quick and an old fashioned winger who puts crosses in and is a constant threat to defenders,” said Neville after the victory over CSKA in Moscow. Performances such as those delivered in the past week are likely to win round supporters grown used to high quality from the right in recent years. But unlike Ronaldo – and David Beckham previously – Valencia lacks the drive for stardom and celebrity. And while the Ecuadorian is less likely to seek fame off the pitch, the distinct lack of entourage surrounding Ferguson’s most-expensive summer signing comes as a welcome change. “I think everyone is very pleased with what Antonio has done,” said defender Rio Ferdinand. Ultimately it is Ferguson that will make or break Valencia, who won the fans’ voted FIFA World Cup 2006 Best Young Player. Naturally, the Scot is fully supportive of his new winger; perhaps even relieved to have a wide player dedicated to his art and not endorsements. “Valencia has been a plus point for the last few weeks. He’s emerging very well, settling into the club, and his confidence is getting stronger,” said Ferguson. “He has tremendous assets for a wide player, but the assets he didn’t show at Wigan were his goals, where he would maybe only get three or four a season. A winner at Anfield this weekend would be a special kind of hat-trick. Antonio Valencia scored and put in a lively performance during his first outing for Manchester United since an £18 million move from Wigan Athletic this summer. The Ecuadorian winger, who was left out of the Asian tour to concentrate on fitness work back in Manchester, was a constant threat from the right wing in United’s 2-1 victory over Boca Juniors in Munich this evening. While it’s early days in the winger’s United career, Valencia’s performance is a major bonus for Sir Alex Ferguson after the departure of Cristiano Ronaldo this summer. Looking every bit the old fashioned winger, Valencia hugged the touchline and was a constant menace to his opposing full-back, before being substituted with about 25 minutes remaining. The questions now are, can Valencia perform against better opposition than Boca and can he maintain a scoring rate better than the 1 in 10 he managed at Wigan? “We know that when you look at his record at Wigan it is not good in terms of goals,” Ferguson told reporters after the match. “He knows that too, but when we assess the individual parts of his game, his athleticism and the power in his shooting, then why should he not score more goals? The wide-man’s strike today came after beating two defenders and shooting low into the corner, although Boca ‘keeper Abbondanzieri will be disappointed with effort. It could be a sign of good things to come. United’s 4-4-2 system in pre-season is almost certainly a signal towards a more compact formation this season. With Valencia deployed wide-right and Ji-Sung Park on the opposite flank, United played in a slightly more rigid fashion than with Ronaldo in the team. But it was always going to be impossible to replace the Portuguese maestro’s ability to be two players in one. Ferguson’s move to deploy two players through the middle makes sense given the strikers at his disposal this season. All four of his principal forwards prefer to work in central areas, with Rooney consistent in his summer demand to move back to his old role. Recognising that Dimitar Berbatov was largely forced into an unfamiliar role last season, Ferguson told The Telegraph today he “expected the form that we have seen from Berbatov so far in pre-season. Last season was a strange one for him and maybe we didn’t use him in the right way. If that really is the case then United’s pre-season programme is as much about finding out which pairs work best together, as it is about fitness. With Rooney likely to fulfill his England role as a shadow striker to Berbatov’s front-man, does that relegate Michael Owen and Federico Macheda to a supporting role? It may do, but Owen’s goalscoring form and the continued progression of Macheda are very positive signs for the season ahead. The worry for United is in central midfield and the left wing. Can one of Nani, Tosic or Park make the left his own in pre-season? Unless an unlikely move for Valencia’s David Silva materialises, then somebody will have to. In central midfield both Anderson – who scored a brilliant free-kick today – and Michael Carrick can expect to start the season. But Darren Fletcher will also have an important role to play by providing solidity in the centre of the park, especially away from home. But United still lacks a true defensive midfielder. Owen Hargreaves cannot return fast enough. Sir Alex Ferguson made his first signing of what is expected to be a busy summer in the transfer market, when Wigan Athletic’s right winger Luis Antonio Valencia Mosquera signed in a £16 million deal yesterday. The Ecuadorian, nicknamed Toño Maravilla, has signed a four year contract on wages rumoured to be around £70,000 per week. “Antonio is a player we have admired for some time now, having spent the last two years in the Premier League with Wigan,” Ferguson said. The tricky wide man, 23, is expected to take Cristiano Ronaldo’s number seven shirt. Despite being highly regarded at Old Trafford, he is unlikely to contribute to the scoresheet as frequently as the Portuguese player, with just seven goals in 89 appearances for Wigan. “I have enjoyed my time at Wigan, but I am thrilled to have the chance to challenge for the biggest honours in club football here,” said Valencia, who has 34 caps and four goals for Ecuador. United jet off to Asia for their pre-season tour in less than three weeks time and Ferguson will be relieved to have conducted his first piece of close-season business. Meanwhile, reports suggest that United are close to sealing a deal for Olympique Lyonnais forward Karim Benzema for a fee of £38 million. While fans will take the speculation with a pinch of salt until a deal is sealed, there certainly appears to be some movement in United’s summer transfer plans.